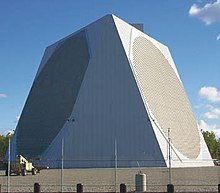 The first early-warning radars were the British Chain Home, the German Freya, the US CXAM (Navy) and SCR-270 (Army), and the Soviet Union RUS-2 [ru]. By modern standards these were quite short range, typically about 100 to 150 miles (160 to 240 km). This "short" distance is a side effect of radio propagation at the long wavelengths being used at the time, which were generally limited to line-of-sight. Although techniques for long-range propagation were known and widely used for shortwave radio, the ability to process the complex return signal was simply not possible at the time. This page is based on the Wikipedia article Early-warning radar; it is used under the Creative Commons Attribution-ShareAlike 3.0 Unported License (CC-BY-SA). You may redistribute it, verbatim or modified, providing that you comply with the terms of the CC-BY-SA.